As China continues to transform itself, many assume that the nation will eventually move beyond communism and adopt a Western-style democracy. But could China develop a unique form of government based on its own distinct traditions? Jiang Qing--Chinas most original, provocative, and controversial Confucian political thinker--says yes. In this book, he sets out a vision for a Confucian constitutional order that offers a compelling alternative to both the status quo in China and to a Western-style liberal democracy. A Confucian Constitutional Order is the most detailed and systematic work on Confucian constitutionalism to date. Jiang argues against the democratic view that the consent of the people is the main source of political legitimacy. Instead, he presents a comprehensive way to achieve humane authority based on three sources of political legitimacy, and he derives and defends a proposal for a tricameral legislature that would best represent the Confucian political ideal. He also puts forward proposals for an institution that would curb the power of parliamentarians and for a symbolic monarch who would embody the historical and transgenerational identity of the state. In the latter section of the book, four leading liberal and socialist Chinese critics--Joseph Chan, Chenyang Li, Wang Shaoguang, and Bai Tongdong--critically evaluate Jiangs theories and Jiang gives detailed responses to their views. 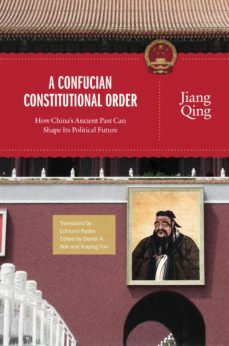 A Confucian Constitutional Order provides a new standard for evaluating political progress in China and enriches the dialogue of possibilities available to this rapidly evolving nation. This book will fascinate students and scholars of Chinese politics, and is essential reading for anyone concerned about Chinas political future.